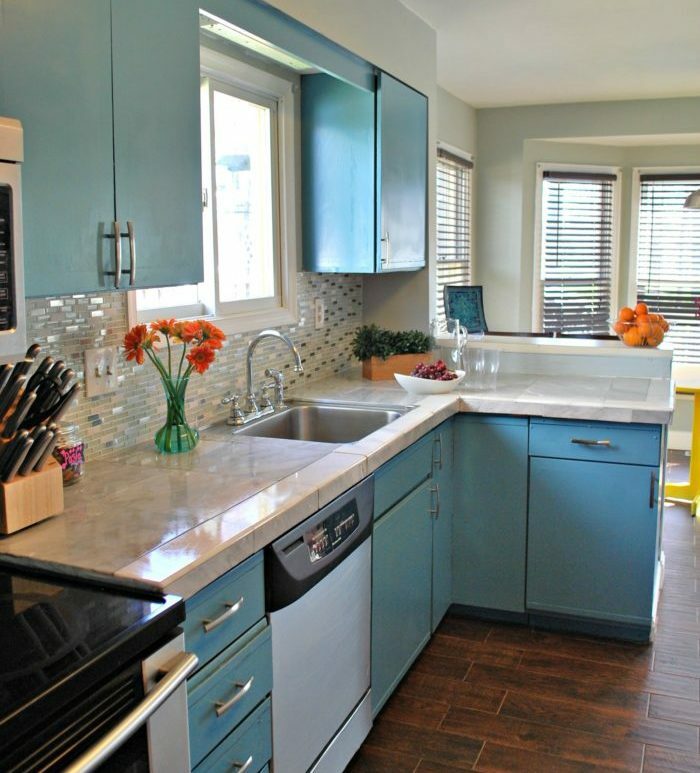 Home » Projects » Countertops » Countertop Makeover Using… Floor Tiles! Marble countertops have been all the rage for the last several years, featured in all the glossy magazine home design layouts, showcased in design showrooms and on those cable TV home renovation shows. But marble anything comes with a huge price tag, most of us DIYers aren’t millionaires with “the sky is the limit” budgets. But we do still appreciate the finer things in life or at least the finer looking things. 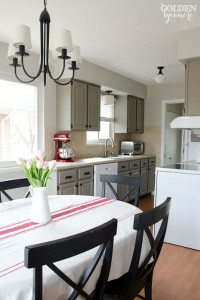 You can have the look of marble on your kitchen counters without the hideously high price tag. 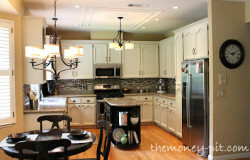 Timisha over at www.toolboxdivas.com transformed her countertops into paeans to the beauty of marble at a fraction of the cost of installing the real thing. The post also provides wonderful step-by-step photos of the project as she worked it. We’ll just give you a few highlights and takeaways. As with every DIY project, preparation is vital. 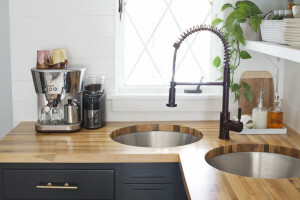 Aside from doing your homework about which tiles to choose and the supplies you need, you have to be willing to devote the elbow grease to preparing the countertop surfaces for the new treatment. This means a thorough cleaning first and foremost. 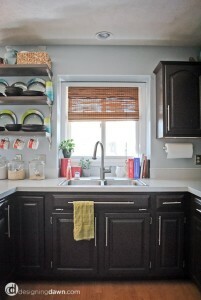 In Timisha’s case, her countertops had a previous faux marble surface treatment in the form of contact paper. In order to do her upgrade it was necessary to remove the contact paper completely from the old laminate surface, including any lingering adhesive residue. Then, further prep of the laminate was necessary which required labor-intensive sanding of the entire surface. 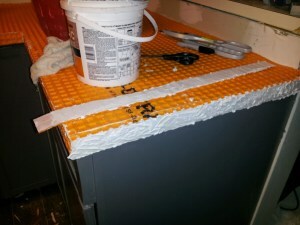 This is required to provide a surface which tile adhesive can bond to. If the surface is not adequately sanded, the adhesive will not stick and the tiles will come loose at first use. Once the sanding is finished, the resultant dust must be completely removed. This is best done with warm soapy water and a damp sponge. The surface must dry completely and a second going over with a dry cloth to remove any lingering dust or grit is advised. 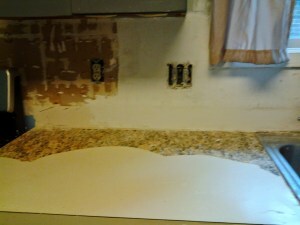 The next step is to apply a waterproof barrier to the countertop surfaces. This is accomplished using something called a DITRA membrane. Timisha provides detailed instructions on the installation of this important element, then goes on to explain the proper way to adhere the tiles using adhesive and grout on her post. Here are some takeaways that Timisha shares on the post. She cannot stress enough the importance of performing several a dry layouts of the tile before settling down to the actual installation. Next, if she had it to do over, Timisha says that she would not choose the 12 x 12 inch flooring, but rather go with the 12 x 24 inch sized tiles instead. 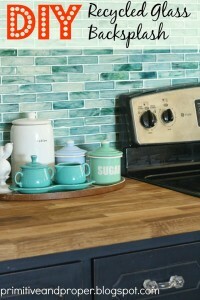 The reason for this is a more professional finish with fewer grout lines. She would also be more careful of her tile saw—never allowing it to sit in water for any length of time as well as freshening the water needed to use the saw each time. Lastly, she cannot stress enough the importance of planning. Don’t just plan once and hope for the best, plan, plan, plan. Don’t cut corners! Prepare thoroughly and you’ll avoid costly errors and unsightly results!